The most exhilarating thing during a pregnancy is waiting for the baby coming out and decorating the nursery. 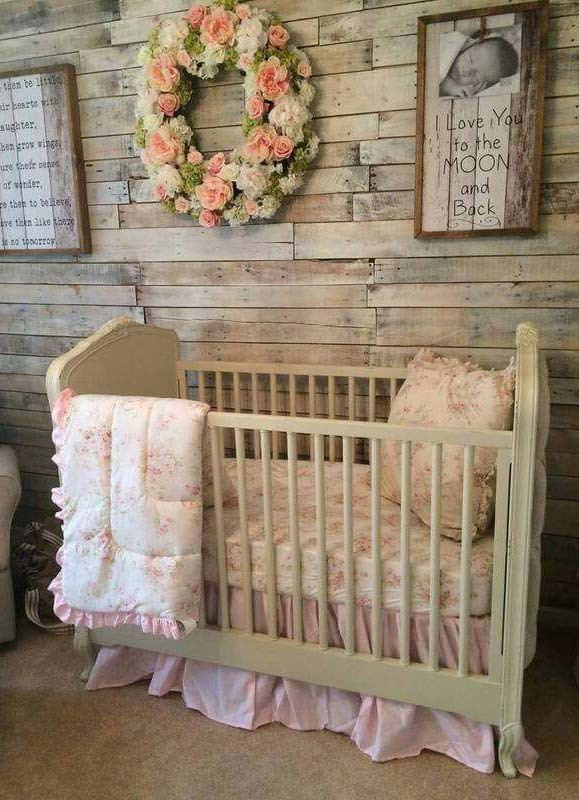 Since you are going to have a baby girl, you might want to decorate her room as pretty as possible. If you haven’t made up your mind yet, check out these 10 cute baby girl nursery ideas that your princess will love. When it comes to decorate a room for a baby girl, floral-themed is apparently the most convenient one. It always brings out the touch of feminine and beauty which suits your baby girl very well. You can find many kinds of flowers – both in 2D and 3D – in this nursery. The floral wallpaper hangs on the wall by the crib, creating a beautiful focal point that draws everyone attention. The most conspicuous flower in this room is the white dandelion. It is not a real dandelion, though. It is just a pendant light looking like a giant dandelion that sheds some light to the nursery. Soft color palette always looks good if applied in a baby girl’s room since it denotes feminine and provides soothing tone. Besides, it always gives the touch of a romantic ambience. Next to the crib sits a gray linen sofa that helps you sit back and relaxed while accompanying your daughter or breastfeeding her. And to ensure your comfort, a linen ottoman is ready to hold your legs when you feel fatigued. Above the crib are some photographs and decorative ornaments with curvy edges denoting the shabby chic style. They make a fabulous centerpiece of this room. Flowers are pretty. And so is your baby girl. She is as pretty as a hundred of roses. 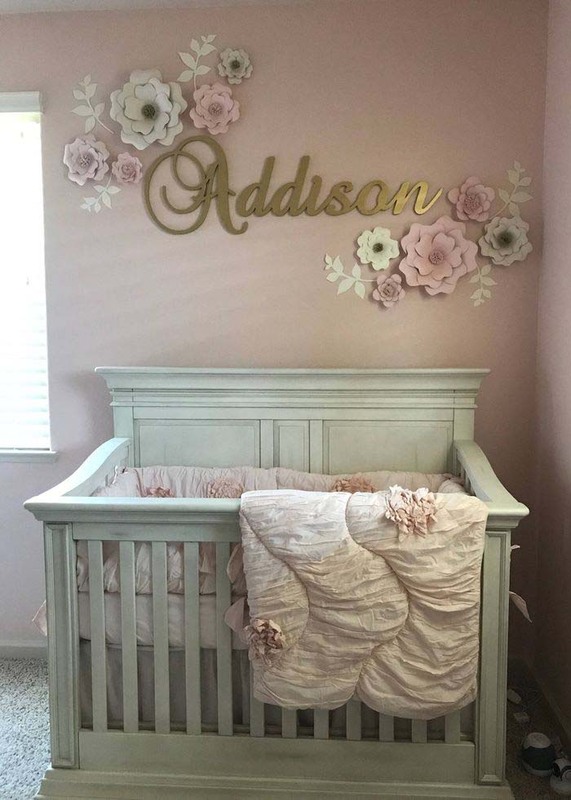 A beautiful little girl deserves an exquisite nursery. And thus, bring a hundred of roses to adorn her room. Well, I think a hundred is just too many. 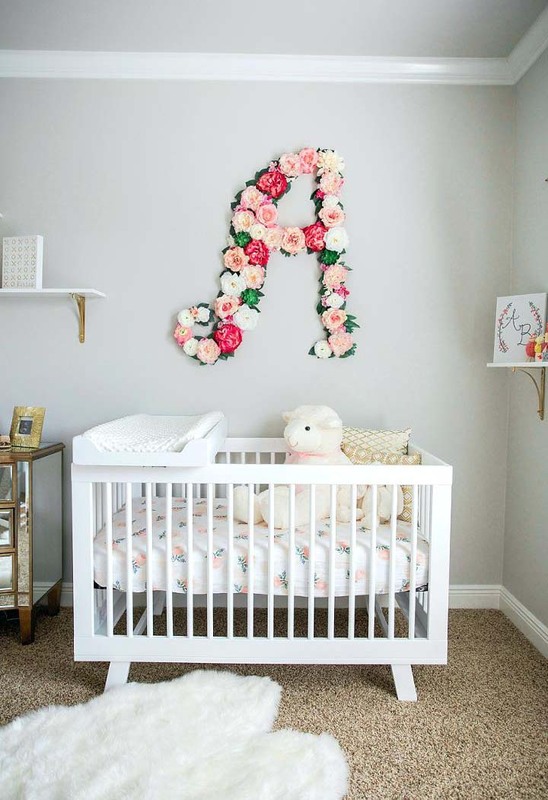 You can get as many roses as possible to form her initial and hang it on the wall above the crib so that it can make a nice focal point. Instead of arranging some real roses that won’t last forever, you can try arranging some paper roses. They can last longer than the real ones without compromising the exquisite look. Preparing a nursery for your first daughter can be beyond thrilled. You might want to paint the room pink so that it suits your baby girl well. Have you ever thought that this room will probably used by her brother sometime? Therefore, you had better use neutral hues like white, blue, or gray so that you can refurbish it in a jiffy. This gray nursery looks great for both baby girls or boys. What makes it difference is just the furniture. 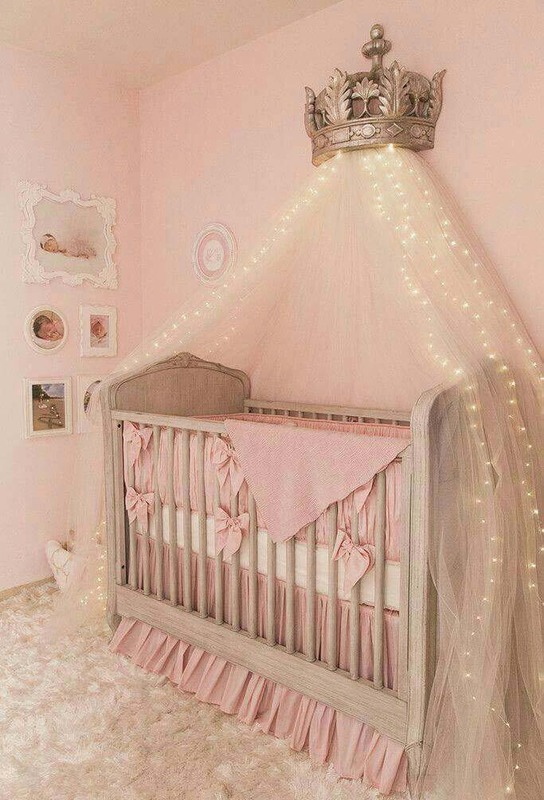 To give the touch of feminine, some pink tints such as the butterflies hanging over the crib are added. I know that decorating a nursery is exciting. You might come up with so many brilliant ideas that entail a lot of money. Don’t succumb to the temptation of splurging out on a brand-new crib and some pretty decorative ornaments that can be costly. If you still have the old crib used by your first daughter or son you’d better restore it in the nursery so that you can save more money. You don’t need to buy some pretty decorative ornaments if you can make them yourself. Some DIY giant paper flowers will be your best bet. They are easy to make and have an outstanding look. Every girl dreams to be a princess. Why don’t you make your baby girl a princess and make her dream comes true? Or at least, you make your dreams come true. This pretty nursery is full of pink stuff which makes it look so girly. To preserve the moments of your growing baby, you can show off some pictures of her growth so that you can tell her one day. Soft and fluffy pink carpet is tacked down the floor, keeping your baby girl warm when she is crawling on it. But the most conspicuous thing is a huge crown perching above the crib. It does not only make a great focal point, but also keeps the mosquito mesh in place so that your daughter can sleep comfortably. There is nothing wrong with using neutral hues like white. The nursery will be just as pretty as a pink one. Besides, you will not need to spend a lot of money to refurbish this room to make it look more suitable for your baby boy someday. This nursery features some book shelves that you can use to store your daughter’s favourite fairy tales. However, it would be better if the shelves were hung a bit lower so that your daughter can reach the books when she begins to learn how to walk. Rustic will never fail to add charm to any room including a nursery. The crib sits against the well-worn tongue-and-groove panelling that reflects a rustic style. This wall is a perfect centerpiece that can draw everyone’s attention. However, letting it plain without any adornment is like there is something missing. Therefore, a floral arrangement and two quotations hang to accentuate the wall. A limited space is not a dead-end. You can still have a cute nursery for your baby even though the room is small. What you have to do is making sure that the room obtains sufficient natural and artificial light so that it looks airy and bigger. Investing on a crib that features some shelves and diaper-changing table would be better. Kids tend be full of imaginations. They can be anything they want in the realm of their imaginations. Why don’t help them to make it to realize it. 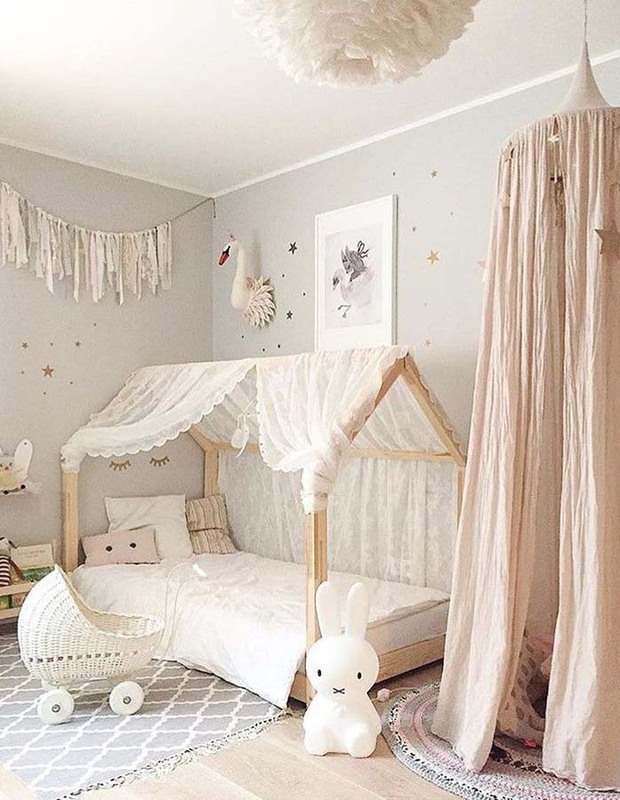 This white nursery is such a paradise. It features hanging curtain that your daughter can use to hide or play a role-play game. The low-level bed enables your crawling daughter to jump out of it without crying out loud for your help. These baby girl nursery ideas are super cute. You can apply one of them and tweak it a little bit, and you will find your baby girl beam with smile.